Summer of 1993, New England Dragway. That’s when and where Steve knew he wanted to become a meteorologist. More than 20 years later he is extremely fortunate and blessed to be able to live his childhood dream. As a lover of math and science, Steve had a consistent interest in weather in elementary, middle, and high school before discovering you can major in meteorology. He attended Lyndon State College in Vermont where he received a bachelor’s in meteorology-broadcasting and associate’s in television news. 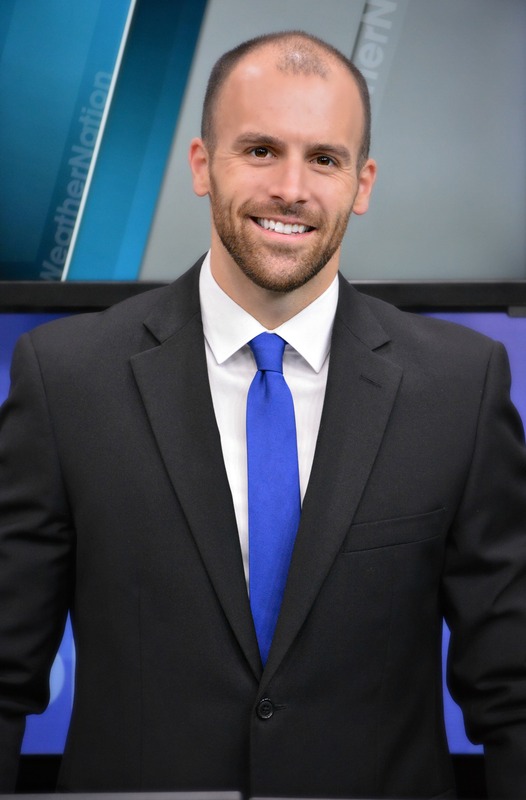 He has worked as a meteorologist and reporter in Winchester, VA, Burlington, VT, and most recently in West Palm Beach, FL. He’s recognized by the American Meteorological Society with the Certification of Broadcast Meteorologists. My parents inspired me. I spent my summer weekends at New England Dragway in New Hampshire where my dad was a drag racer. He asked me to watch the weather for him. I had to monitor temperature, humidity, pressure changes, wind direction, sky cover, ,etc. because all of those weather variables affected his race car. Together, we calibrated his car together, based on the weather, so it could run up to its full potential. Recently my most memorable weather experience was covering Hurricane Matthew in the Bahamas. I was only about 30 miles from the eye of the hurricane, which was a major hurricane as it passed to my west. I truly respect the power of weather and it was an eye-opening experience of how strong, dangerous, but beautiful weather can be. My hobbies and interests are exercising and sports. I love staying active. I also love food, so you'll find me in the fridge often. I have a strong religious faith, so I'd have to say God. It pushes me every day to make a positive influence on every person I come into contact with. I call myself an 'amateur competitive eater.' I'm not up to the standards of the professionals, but I love attempting an eating challenge or two. To educate everyone about weather inside and out, protect lives and personal property, and improve the ability of forecasting.